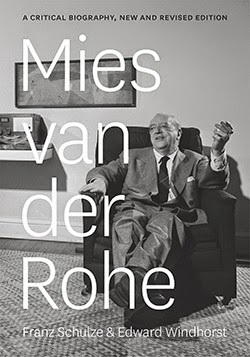 Ludwig Mies van der Rohe (1886-1969) is one of the triumvirate of 20th century architects (the other being Le Corbusier and Frank Lloyd Wright) who continue to be the subject of books long after their passing. They are the most influential architects of the modern age, with each afforded the occasional reassessment due to exhibitions, preservation battles and other contemporary happenings (Le Corbusier's recent labeling as a "militant fascist" is an example on the negative spectrum of this). Even with so many books devoted to them, each architect has been misunderstood over time, but none more than Mies, who is often blamed for every mediocre glass box that litters cities in the United States and beyond. Such blame is unfair, so it's good to have books, like these three, that effectively argue for the lasting qualities of his (then) unique approach to architecture. Unique approaches can be found in these books: Sharoff and Zbaren (authors of the "American City" series that includes St. Louis Architecture) have created a case-study of the IBM Building, considered Mies's last commission, and his work in Chicago, while doubling as a coffee table book with its large format and generously sized photographs; Detlef Mertins, whose book was published three years after his 2011 death, has crafted a thorough historical monograph that is given the Phaidon touch, meaning it was made big and illustrated profusely; Franz Schulze has updated his equally thorough biography with Chicago architect Edward Windhorst to address new information and positions on the architect since its initial 1985 publication (the two MoMA/Whitney shows, Mies in Berlin/Mies in America, in particular), and to incorporate newly released information, such as transcripts from the trial with Edith Farnsworth. That Mies is a continuously appealing subject for writers and architects is due not just to the buildings he created. It also arises from his personal life, a two-act, made-for-TV story (not as dramatic as Wright, but close) that started in Germany and saw him leave his family and war-torn Europe for the United States, where he changed the course of modern architecture. This appeal arises from the influence he had and continues to have on architecture, not just in terms of mundane glass boxes, but through the school he set up (Armour Institute of Technology, now Illinois Institute of Technology or IIT) and in the beautiful modern buildings created by architects who embraced his artistic approach to architecture and attention to details. The three books – Mies van der Rohe, Mies, Last Is More – break down respectively along these three subject lines: Mies's life, his buildings, and his influence. Of the three books, I'd recommend Schulze and Windhorst's Mies van der Rohe to those with little familiarity of Mies and those who know his buildings but not his story. It has the greatest proportion of depth to readability. It is a smooth narrative that occasionally veers off course when discussing Mies's buildings – the "critical" approach is laudable, but many of the buildings get bogged down in dry descriptions that could be aided by more illustrations on more than one occasion. 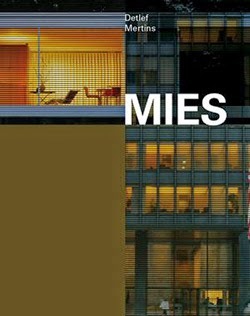 But when the authors tell the story of Mies's life, which of course encompasses his architecture, not just the personal parts outside of it (the relationships, the health problems, and so forth), and discuss the details of Mies's buildings (many carefully illustrated) the book is excellent, explaining not only the what but also the how and why of his buildings. Schulze and Windhorst delve into detail on the most important Mies buildings (ignoring or just briefly mentioning ones carried out primarily by his associates, such as 2400 Lakeview), which is a trait that is shared by Detlef Mertins in his historical monograph. He also tells the story of Mies's buildings chronologically, going into depth on nearly 20 projects, both built and unbuilt, but when he discusses them his historical skills shine, aided by numerous photographs and drawings. Given the length and size of the book, it's not one to be read from front to back like Mies van der Rohe (it can be, but it's not for the faint of heart); instead one can delve into any of the five sections or the chapter project histories as desired. With Mertins' depth of scholarship and dense but readable style of writing, each chapter functions like a case study in its own right. Beyond the particulars of the significant projects, though, Mertins does an excellent job of elucidating the ideas behind Mies's buildings, the philosophical positions that led to his architecture of order and clarity. Just as Mertins' book is separated into five sections, so is Last Is More by journalist Robert Sharoff and photographer William Zbaren. But the similarities end pretty much there, as the duo presents Mies in a much easier to digest manner, starting with a quick history of the architect in twenty pages. The IBM Building – now home partly to the Langham Hotel, which prompted the creation of this book – is the subject of the second chapter. 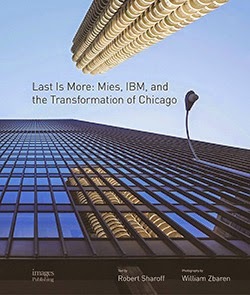 The first chapter and the subsequent ones – on buildings in Chicago inspired by Mies, on early Chicago landmarks, and on the Langham itself – serve to situate the IBM Building in a larger, albeit still local, context. It's a unique approach that benefits greatly from Zbaren's great photos, which give the book a visual consistency, even when it is presenting Wright or Sullivan, rather than Mies. While the quick history and compact chapters might leave some wanting more information on the larger-than-life Mies, they need look no further than the other two books reviewed here.